July 2018 came as a sheer surprise to many people around the world who watched in awe as Eritrea and Ethiopia, two long-standing foes, decided to settle on a highly-anticipated peace deal. The signing of the peace agreement has not only marked a watershed in the history of relations between the two nations, ending decades of seething hostility akin to a cold war, but has also restored the unity of the countries’ people, who share similar cultures, traditions, and inextricably linked histories. However, several key questions are yet to be answered, including what kind of changes will result in East Africa and how the deal will translate into tangible reforms in the two countries’ domestic spheres. Before the advent of the peace deal, Eritrea and Ethiopia had been stuck in a frustrating ‘no war, no peace’ impasse for two decades, which has led to nothing but poor diplomatic ties and extremely militarized borders. Border crossings between the two countries were off limits, which led to the separation of many families and the banning of trade. Now that the borders have reopened, families divided for years have finally reunited, and trade is said to have resumed. Ethiopia has immediately begun reforms following the signing of the peace deal, with one notable and popular reform being the release of its political prisoners. Hailed by the international community as the dawn of a new period for the Horn of Africa, the peace deal between Eritrea and Ethiopia is expected to be the first of many steps to decisively establish peace and security in the region. Since this military threat no longer menaces either country, the expectation for Eritrea and Ethiopia is that they will now attend to developmental efforts and cooperate to bolster their economies. Currently, both countries (mainly Eritrea) rely on remittances from their vast diaspora populations to sustain their economies. Along with the formation of tight political and diplomatic ties, Eritrea and Ethiopia might also potentially form regional integrated economic systems where both can stand to gain. 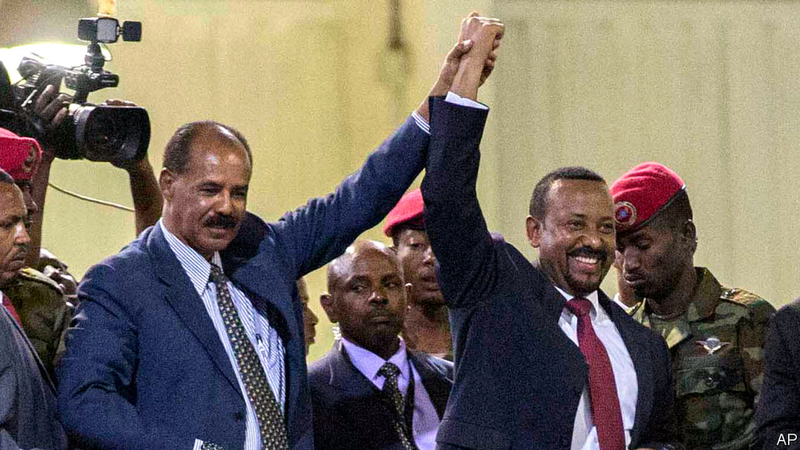 After Eritrean President Isaias Afewerki’s initial reluctance to respond to Ethiopian Prime Minister Abiy Ahmed’s peace deal proposal, he has now been spearheading subsequent diplomatic advancements amongst other East African nations alongside Prime Minister Ahmed. Eritrea’s position as an outsider on the international stage before July 2018 has been the result of historically tense relations with Ethiopia and its allies, including the United States. In 2009, the United Nations imposed an arms embargo on Eritrea, claiming that it had allegedly provided support to a militant group, Al-Shabaab, in Somalia and had refused to withdraw its troops from a disputed border territory in Djibouti. Following Eritrea’s restored amicable relations with its neighboring countries Ethiopia and Djibouti, the UN lifted its sanctions and arms embargo from the nation, allowing for significant economic development. President Afewerki’s maintenance of Eritrea’s current policies has been attributed to two reasons: Eritrea’s tense relations with Ethiopia, and Ethiopia’s refusal to relinquish its claim on Eritrea’s territory, Badme, which is located on the border of the two nations. Now that Ethiopia has vowed to recognize and uphold the commission ruling in 2002 granting Badme to Eritrea and placed itself in the vanguard to dispel all tense and strained relations with Eritrea, Eritreans, along with the international community, now wait to see whether President Afewerki’s policies will be discarded or if he will adopt a pretext to continue with current ones. Before Prime Minister Ahmed’s inauguration, Ethiopia actively sought to destabilize Eritrea, chiefly by wielding its partnerships with the West in its endeavor to further isolate its longtime foe, particularly after the 2002 border commision ruling. Ethiopia, in abortive attempts, has filed an accusation in 2016 in an effort to stage a case against the Eritrean government for committing crimes against humanity and attacking its border. Eventually, attempts to destabilize Eritrea became not only costly but burdensome for Ethiopia, especially when it was grappling with its own internal ethnic turmoil. Prime Minister Ahmed’s appointment was vital in the initiation of normalizing relations with Eritrea because the shift within the Ethiopian People’s Revolutionary Democratic Party (EPRDF) and his Oromo identity made it possible for Ethiopia and Eritrea to dispel their decades-long tension by ousting the Tigray People's Liberation Front (TPLF), the party which has formerly dominated Ethiopia’s government for more than two decades. Historically, after the Eritrean People’s Liberation Front (EPLF) — which was then a rebel group — helped the TPLF topple Ethiopia’s Marxist regime, the relationship between the EPLF and TPLF gradually deteriorated to the point where the TPLF has been at the forefront of amplifying the tension and threat between Eritrea and Ethiopia as well as heightening unrest at home by antagonizing some of the ethnic groups. This is evident in the recurring protests by the Oromo and Amhara groups. Now, with the TPLF sidelined, peace and cooperation between Eritrea and Ethiopia has never been more feasible. The historic peace deal between Eritrea and Ethiopia has spurred a series of diplomatic breakthroughs amongst other nations in East Africa. For example, the rapprochement between Eritrea and Djibouti has received praise from the international community as another step towards establishing a sweeping peace in the horn. Djibouti and Eritrea have been at odds ever since the two countries descended into a clash in 2008 over Dumeria, a disputed border region that both countries claim as their own. After the restoration of diplomatic ties between the two African countries, Djibouti’s Foreign Minister Mahmoud Ali Youssouf stated, “With the truthful willingness demonstrated by Eritrea and Djibouti to make peace, all other pending issues will find their way to resolution.” The normalization of relations between Eritrea and Somalia has also been a noteworthy event of late after Somalia’s president, Mohamed Abdullahi Mohamed, visited Asmara to restore diplomatic and political ties following a decade of hostility. The animosity between the two officially took off after Eritrea was accused of supporting the militant group in Somalia. The pursuit of regional peace has evidently, and successfully, been undertaken by President Afewerki and Prime Minister Ahmed, but we must wait to see what the economic practicalities of this deal entail. What is certain is that Ethiopia’s biggest gain from the normalization of relations with Eritrea is its access to the Red Sea ports. Until now, the landlocked state has been paying very costly fees to Djibouti for commercial activities, but now peace with Eritrea means that Asab will presumably emerge as Ethiopia’s primary trade port. In exchange, Eritrea will no longer need to expend its efforts to bolster its national security in order to deter Ethiopia’s military threat; it is now able to establish a benign presence on the international stage and form diplomatic ties with other countries. With open trade-routes, Eritrea can now have access to markets in Ethiopia, and Ethiopia could even perhaps invest in Eritrea along with accessing its ports. Citizens of both Eretria and Ethiopia hope that this mutually beneficial partnership and newfound regional peace will soon translate into domestic policy reforms within the two countries. If successful, these reforms could ring in a new era of prosperity both within and without these countries’ borders.